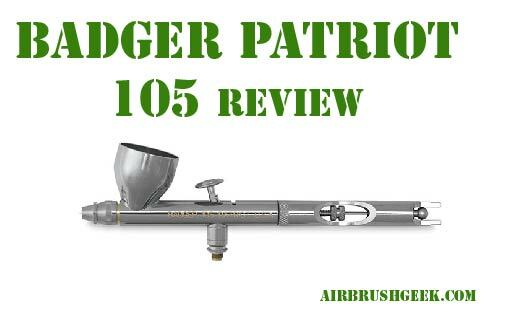 Badger Patriot 105 Review: Let me introduce you the badger patriot 105 airbrush. I must say to you, this is one of my favorite airbrushes out there at the moment. I will try to tell you why in this following review. The Badger patriot 105 is a gravity feed, double action airbrush. It is really an all-purpose airbrush, ideal airbrush for a large variety of different projects with its 0.51mm needle. It can be used for project going from model making to T-Shirt painting or even cake decorating. I must say, what really stroked me when I first used this airbrush was its ease of use, making it ideal for beginners just starting with airbrushing. The badger Patriot 105 comes in a nice solid padded plastic case. I might seem irrelevant for some but I find it very handy as I like to keep my tools tidy. The Badger Patriot 105 looks very goods, nice shiny chrome , and I it is built with high quality materials. There is no plastic handle or things like that, it looks and feels really solid. It comes also with a spare tip. Now, holding the brush, I found the Patriot 105 very well balanced in my hands, indeed very comfortable to handle. The trigger feels very smooth and light when pulled. One nice feature on this airbrush is the trigger tension adjustment. By default the trigger tension is set with maximum trigger tension which should be suitable for most users. If less return spring back pressure is desired, you can partially unscrewed the spring screw to lessen the spring pressure. The badger Patriot 105 comes with a 1/3 ounce permanently mounted colour cup with a convenient plastic spill-proof cap. The cup, by its rather large size, is perfect for large projects. Also, I like this plastic cap because I find it much easier to fit than a solid chrome one but most importantly easier to clean. There is also a cap for the needle, so when you put it on, you don’t need to worry about damaging the needle. Speaking of the needle, you will notice that the needle is sticking out a little bit behind the air cape. You usually find this feature on more expensive brush. This allows you get more fine details or use some more advanced techniques that more experienced users would normally use. The fact that the needle stick out a bit behind the air cape, means also that you will have to be careful to protect the front of the needle using the needle cap described before.The last thing you want is a damaged or bent needle!! Careful cleaning and maintenance of your airbrush is essential if it is to continue to work effectively. Another interesting feature of the Patriot 105 is that it has a cut out handle on the back that gives you access to a knot. This knot will allow you to remove the needle without taking the handle off. Very very useful feature as most airbrush will require you to unscrew the whole handle in order to remove the needle! Not the Badger Patriot 105! So this makes it super easy to clean the needle between jobs and I can tell you it will save you a lot of time. Taking apart the badger Patriot 105 can’t be any easier. All the airbrush’s parts just need to be finger-tight to work to perfection. No need of pliers or any other tool. The airbrush comes with a great instruction booklet (you can download it here) with a very clear diagram showing how all the different parts are laid out and how they relate to each other. Great help if one of the pieces get lost for instance. You can also find the part numbers for every single parts so that it is easy to order a new one if needs to be and that will ensure you order exactly what you are looking for. The Badger Patriot 105 can easily handle 30 PSI or even 35 PSI, as well as lower pressure settings for detailed work (10-15 PSI), making it suitable for many applications including: custom automotive art, body art, graphic arts, illustration etc…The airbrush is ergonomically balanced for hours of comfortable airbrushing. It will take both acrylic or enamel paint. Thanks to its large cup, this airbrush is ideal when working on large project. No need to refill the cup several times. Some people will find that the large cup can block the view when working close to a project. For those people I will suggest the Badger Air-Brush Co 105-2XR Patriot Arrow which comes with a smaller cup (1/16) than the original Patriot 105 and allow the airbrush users to comfortably spray closer to a project. Regarding the spray pattern, the Badger Patriot 105 goes from pencil line to a 3’ spray pattern. For the hobbyist this airbrush can do fine details but also suited for background painting. The easy way to remove and clean the needle makes it also ideal when you work on a model spray jobs that require a lot of colour change .You can remove the needle quickly, use a bit of thinner to clean it, wipe it with paper towel and then use another colour. I personally find the Badger Patriot 105 airbrush absolutely awesome. This is really an high quality build airbrush at a very competitive price . Very easy to clean and disassemble , it is the ideal airbrush for beginners but it will also suit more advanced users. Very versatile tool, the Badger Patriot 105 will suit most project works, those that require large surface coverage but also be suited for projects with more fine details. I agree with this review, the Patriot 105 is a great airbrush. I think what makes it for for is that feature that allow to remove the needle without taking off the handle…..make it so much easier to clean the airbrush…..